Renault Duster is a characteristic SUV with aggressive looks as well as power. This SUV is offered with ABS and two Airbags. This Variant is available in numerous colours such as Pearl Supreme White, Metallic Woodland Brown, Metallic, Metallic Graphite Grey, Metallic Fiery Red and Pearl Galaxy Black. The overall length of the vehicle is 4.31 meters which is shorter than its big brother Koleos, having width of 1.82 meters. Renault Duster features include 1598cc 14b DOHC engine which produces 100.3bhp at 5850 rpm and maximum torque of 145Nm @3750rpm. 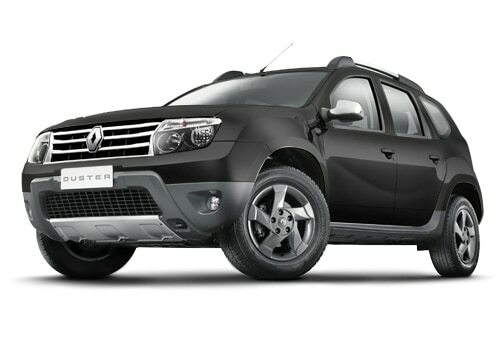 Renault Duster price is Rs 7.99 Lakh to 12.18 Lakh (Ex-showroom, New Delhi). The diesel version is powered with 1461cc turbocharged diesel 14 SOHC Engine that are able to deliver two power figures. Its fuel efficiency in all likelihood is great since the SUV Car is more frugal than other SUVs in India. The dCi diesel engine of the SUV is tuned to two different states putting out two different power outputs (83.8bhp and 108.5bhp). It is quite apparent that petrol variant of the model do offer lesser mileage in comparison to diesel ones. Its no different as petrol ones offer a mileage of 13.24 kmpl. The music system which are integrated in the vehicle are decent, although we desire that the speakers could have been a tad better. This variant is offered with integrated 2DIN Audio with USB as well as 4 speakers along with Bluetooth. The high end variants are offered steering mounted controls as well as music systems are good. The vehicle is equipped with bigger wheels and it not only provides a perfect look to the SUV, but also helps to perform off road. The vehicle has been fitted with 16 inch steel/alloy wheel to provide better grip as well as stability. The tyre size of the vehicle is standard. The car maker has offered an upper hand so that more safety is offered by introducing additional safety features. It has also incorporated hydraulically operated diagonal split with dual circuit braking. This global variant suits both city as well as rural roads. Despite of having frugal engine, K9K does have good drivability as well as sufficient torque in order to potter around in city. There are no turbo laga either and it does make its cases stronger for good buy. Buyers who intend to have a look at the Renault Duster pictures do visit the photo gallery of the Renault cars. Even those who are interested can download the pictures by clicking on the download button. And few would be interested to have them as computer wall papers. Nissan company ready to launch its first compact SUV (sports utility vehicle) based on Renault Duster , named as Nissan Terrano, it's first stable SUV from Nissan.